14:40 min. What Will Be Covered In This Workshop? 19:30 min. What Are The 3 SUCCESS Tips? 35:16 min. Why Do You Want To Be A Makeup Artist? 2:43:40 min. Q & A: "Ask Me Anything"
2:46:08 min. 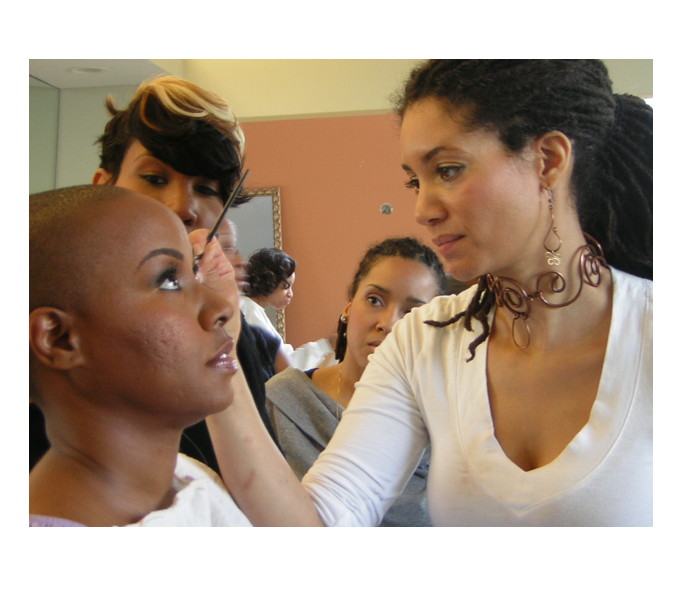 What is The PRO MakeUP Artist Training Program? PREVIOUS EXPERIENCE IN APPLYING MAKEUP IS VERY HELPFUL BUT NOT REQUIRED TO PARTICIPATE IN THIS PROGRAM. The best makeup artists are painters. We will learn fundamentals of color and the properties of light, color, color mixing and creating beautiful color palettes. The skill of sculpting the face is a clear knowledge of utilizing line, shape, value, contrast, form, shading, optical illusion, composition, proportion, focal points, weight, texture and brushwork to get your desired look. We continue our journey into exploring a painter’s tools and techniques . Transferring our painterly way to the human face, we embark on a study of human faces, the properties of the mediums of makeup, experimenting with application and approach of balancing the face, blending, and brushwork. With a focus on eyes, we continue to translate painterly techniques to the face and experiment with the properties of the mediums of makeup. With a focus on lips, we continue our journey of painting the face. This session includes an airbrush makeup demo as well as using lighting as a makeup ally. A historical and cultural exploration of creativity & style of makeup as well as original approaches of interpreting the face. Continuing to move through history & cultures w explore creativity & style in makeup throughout history as well as original approaches of interpreting the face. By this session you are really beginning to hone, perfect and develop your own personal style. You will have an opportunity to present two looks on a model of your choice and share with your class participants. Who Will Have The Most Imaginative & Flawless Face? SESSION 11: TOPIC: Who Are You With? Setting your rates, licenses, unions, good studio practices, job etiquette, YOUR look, and bookkeeping tips. COMPLETION - FOLLOW-UP: How’s It Going? A one-on-one follow-up on how you are integrating all of the elements for your career success. Participants will spend a two-hour weekly session in our studio implementing that week’s topic on the public. TBD as well as an online component.
. : Your Next Steps : . 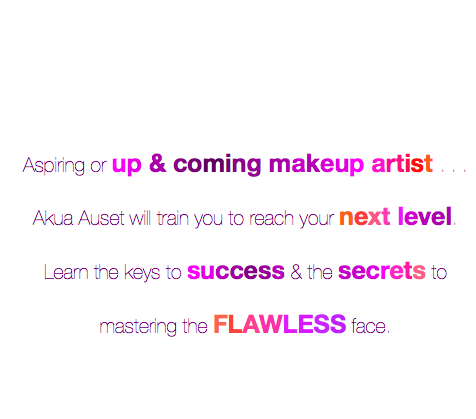 Akua Teaches You How-To Master Your Own Face beginning with a Critique and a comprehensive lesson. Part II: FOLLOW - UP: How's It Going? career options of working in makeup artistry. fundamentals and properties of light, color, color mixing, line, shape, value, contrast, form, shading, optical illusion, composition, proportion, focal points, weight, texture and brushwork. the human face, properties of the mediums of makeup, creating palettes, experimentation with application and approach, blending, brushwork, techniques and airbrush makeup. exploration of creativity & style of makeup throughout history as well as original approaches of interpreting the face. principles, campaign, tools, relationships, etc. 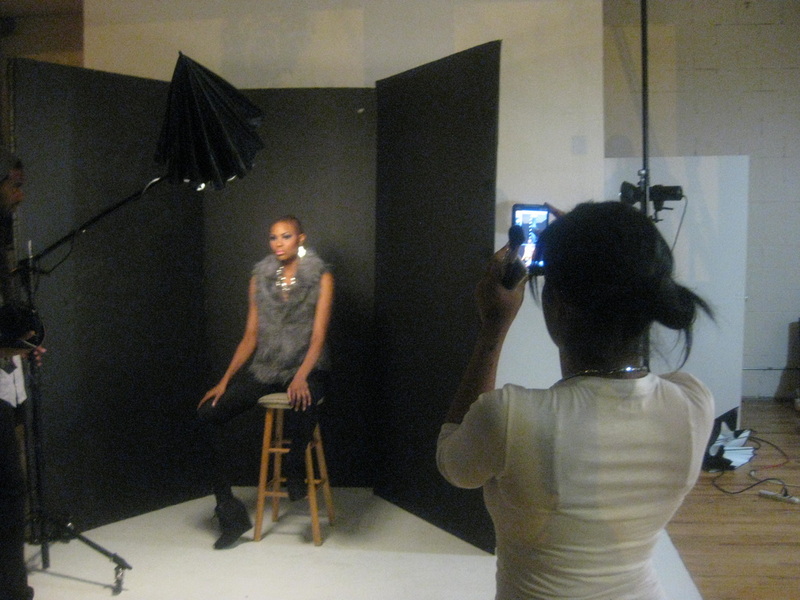 best studio practices & etiquette, YOUR look, setting rates, licenses, unions, etc. Learn and develop your skills as a creative artist and prepare for the demands of a next-level career in makeup artistry. You will create a professional makeup artist’s kit, get a critique of your work, a career strategy session, access to makeup discounts, photo shoots featuring your work, apprentice and internship opportunities. $2800* 12 sessions ($234 per session) $200 SAVINGS! Your space in a class cannot be confirmed until payment is received or payment arrangements are made. Advanced registration is strongly recommended. There is limited space available. Payment plans are available, but must be arranged with the Registration Manager upon registration. A $100 processing fee will apply. Any late payments will accrue an additional $25 fee each month. If METAMOORPHOSE cancels or changes the scheduled time of a session, thus preventing a student from attending, METAMOORPHOSE will issue a full refund to the student. Tuition refund payments will be processed and mailed to the student within three weeks from the date of cancellation or change. If a student withdraws from the session/program there is no tuition refund. Cancellations or NO-SHOWS are non-refundable and the full tuition will be charged.